-In yet another challenging day, Gerard manages to get back among the best (sixth). -The leader of the Himoinsa Team is the only Spaniard with options in the motorcycle category. -Oliveras and Solá also have a solid finish in the first half of the marathon stage. When Gerard Farrés announced before starting the 2018 Dakar Rally that this would be his last participation in the motorcycle category, many thought that this announcement could put a halt to the Catalan’s performance and aspirations, this has turned out to be far from true. In an old school Dakar, just like they were in Africa, with complicated dunes and navigation, the toughest race in the world is keeping everyone on their toes and that means that Gerard Farrés always has a place among the best. As it happened in the early stages of Peru and practically in all stages, the layout of this rally is unforgiving, and the arrival of the feared dunes of Fiambalá in Argentina have caused huge upsets in the classification. The fastest riders have their backs against the wall, the least experienced are lost in the desert. In these extreme conditions it seems like the old fox of the desert,called Gerard Farrés, never fails to impress. In the first of the two days of this new marathon stage (only for the motorcycles), Farrés, motivated by his ascent in the general classification on the previous day, went on the attack and fought a nice duel against the chrono during all the day, in front of the KTM and Honda’s factory riders, among which he sneaks into every day. The race format was somewhat altered because the ten best cars of Tuesday’s stage were interspersed with the ten best bikes, with Gerard starting just behind Cyril Despres and in front of Terranova. While Quintanilla struggled losing a good handful of minutes, or Barreda, exhausted, abandoned the race and Svitko did not even start, the Himoinsa’s red KTMs shone again and got into the fight with Price, Benavides, Meo, Brabec and Walkner, to finish in a meritorious sixth place, with few lost minutes, mechanically and morally well prepared for the second part of the marathon stage which could be decisive in Dakar 2018. 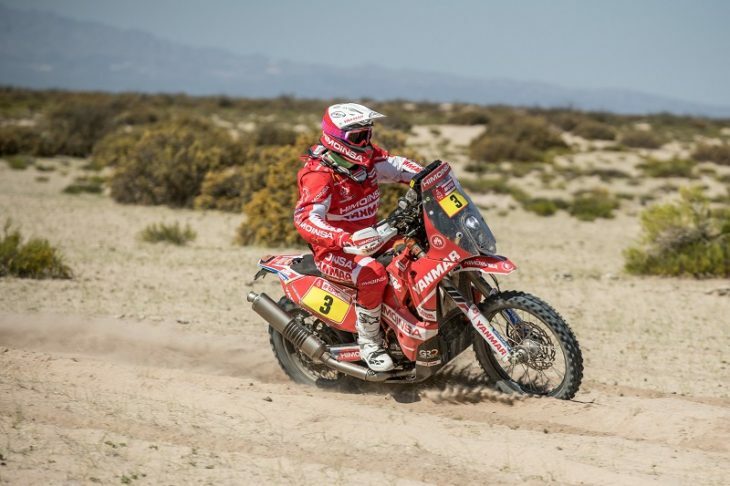 Gerard holds on to the fourth position in the Rally and is the best Spaniard on a motorcycle. On this day, which had started in a sad way for the team due to the withdrawal of Rosa Romero due to that unfortunate cut in the leg suffered in the previous stage, Dani Oliveras, continued to solidify himself as the revelation rider. Marc Solá also shows that he is a tough man and also reached the finish in a well deserved 26th position. The riders will sleep with their bikes, but without assistance, in the Chilecito camp and tomorrow will face what may be the Dakar’s last great challenge. Gerard Farrés: “I’m happy, today the goal was to avoid bike problems because tonight we do not have mechanics. Beside that, I was able to ride at the leader’s pace and maintain my position in the overall”.